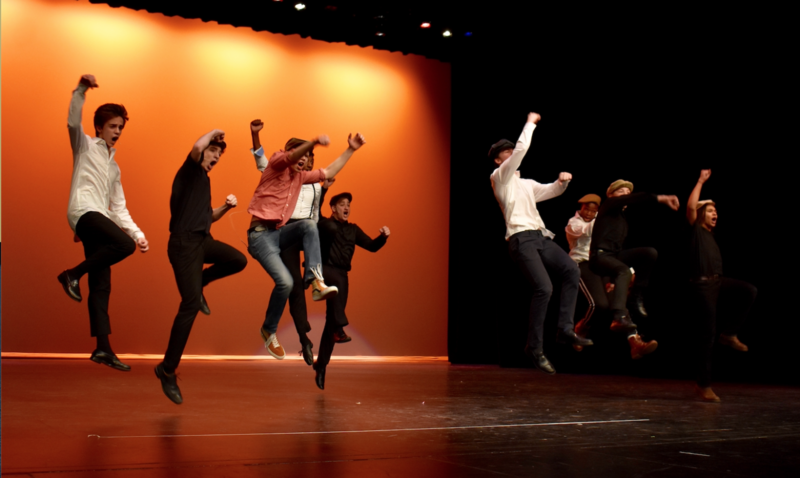 Every year for the past three years, the theatre department organizes the Broadway Benefit – a series of theatrical acts performed by students with proceeds going to a charity. This year’s theme, Movie Musicals, encompassed the performance of songs and dances from various shows, seen both on stage and on screen. “The atmosphere of the cast is very positive. We all encourage each other by complementing each other’s performances and getting each other really excited to be in the benefit. I love having a cast like this because we all love each other and are proud of each other,” said junior Gretchen Peters. Act one, in which Peters participated in, was filled with a “compilation of songs and dances from various musicals” said senior Mollie Menuck. One of the performances within Act One was a song and dance combination from the famous musical and movie Newsies. “My favorite part was the Newsies Medley. It was so amazing to see the transformation between my peers learning the basics to actually performing it with choreography,” said Peters. The charity for this year’s performance was the theatre department itself. The event raised money for the Broken Leg theatre company to help pay for the cost of sets, costumes, and other needs for future theatre productions. This year, the Broadway Benefit raised over $6,500. Mary Bogrette, the theatre teacher and director, has implemented her own ideas, restructuring the BHHS Broadway Benefit. “I had never actually seen the Broadway Benefit the way it was done the previous two years so I just went off on what I thought it should be, and tried to make it so it would include as many [students] as possible,” said Bogrette. Bogrette added her own twist by re-introducing the idea of a second act to the Benefit. She did this by not only having a first act highlighting individual performances, but she added another aspect to the Benefit by adding a one-act play, which is a play with no intermission, as the second act. The one-act play was the show The 39 Steps, a murder-mystery play parodying Alfred Hitchcock’s movie The 39 Steps. This year was also the first year for the upcoming fall musical to be announced before May. During intermission, band teacher Alan Posner announced Fiddler on the Roof as the 2019 Musical at Bloomfield Hills High School.